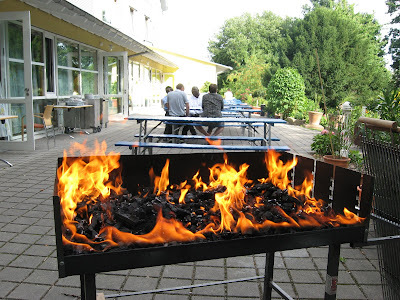 A barbecue with grilled steaks and bratwursts on the patio provided good food and fellowship Thursday evening at the CHARIS gathering in Bad Homburg, Germany. The youth hostel there has provided an excellent venue for the meetings of the assembled worldwide leadership of Grace Brethren churches, numbering about 55 delegates and support people in total. The group has been sobered this week to pray for the health needs of Gami from Portugal, a delegate who was not able to attend, because of a serious infection. One of the translators, Jennifer McCaman, was also hospitalized in Frankfurt Friday with infected tonsils, and prayer is requested for her recovery and wisdom about surgery, as well.